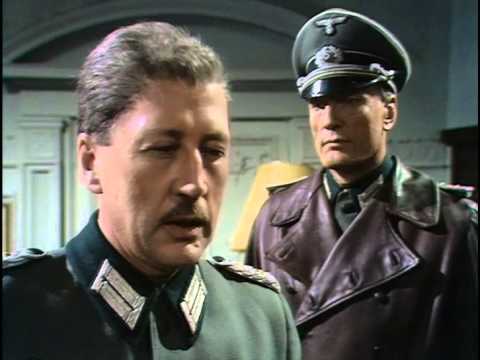 It is 14 January 1974, and time for another episode of Colditz. One of the greatest strengths of Colditz is how the series managed to find fresh angles on the same activity each episode. "Ghosts" presents a particularly clever variation: Player and Brent's use of the priesthole accidentally collides with a failed tunnelling attempt by some French prisoners, which leads the Kommandant (Bernard Hepton) to seal up the chapel completely. The episode's goal, therefore, is not to escape any more but to somehow save Player and Brent's lives without having to admit they are there to the German guards. The episode is a great showcase for Carter as the new escape officer. He almost escaped, and broke his ankle in the process. Now he's intent on beating the Germans and getting as many officers out as possible. Despite the disastrous circumstance that has seen two of his fellow officers trapped in the freezing dark, he refuses to go to the Kommandant and admit they are there. The longer he holds out, the more likely it is that Player and Brent will die, but if he can get them out without the Germans knowing he can potentially use the hiding place again. It is an appaling sort of Schrodinger's Cat experiment, only instead of a radioactive isotope there's a frustrated Englishman's pride determining whether or not his friends die. The whole episode ties into the generally darker tone I noted in the first episode. Carter really pushes the edge of what is acceptable here, and given the blunt realism presented in earlier episodes there is every chance the series will kill off either Player or Brent. The tension is marvellous, and the cynical, dissatisfied way the episode leaves its cast is brilliant.